A couple of minutes ago we published the second beta for Adium 1.5.11. Aside from fixes to Yahoo! and Twitter, this also includes a revamped authentication mechanism for Google Talk. You will notice that you will have to authenticate your account again. 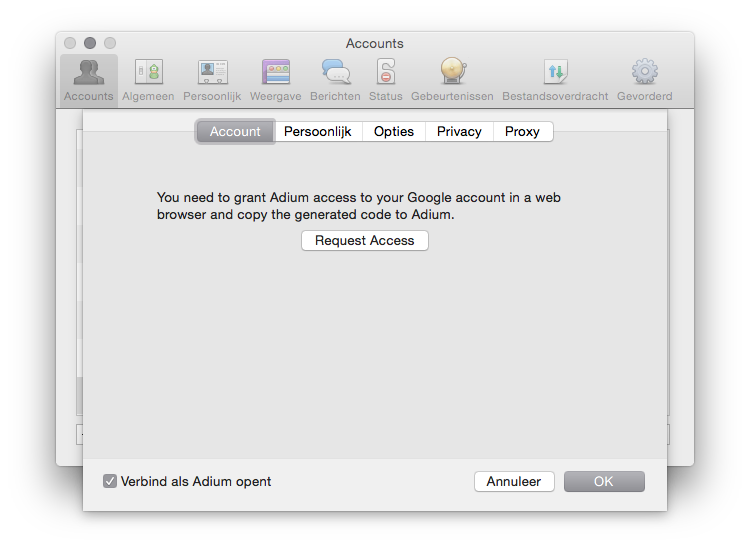 This will open your browser, and after granting Adium access you’ll have to copy a code back to Adium. 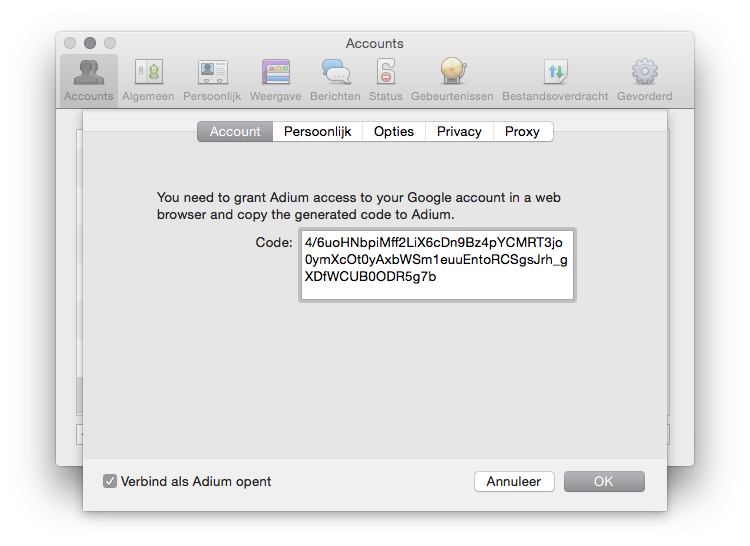 From then on, Adium will have access to your account without having to store your password (though we had always stored it securely in your keychain). This will be good for the security of your account and make it easier to set up Adium when you have two-factor authentication enabled (which we highly recommend!). Access to Google Talk, which we clearly need. Basic account info. We only use this to let Adium automatically know your @gmail.com address, which we need to connect. This address is only stored on your Mac and will never be sent back to us. We do not know yet how long you’ll still be able to use Google Talk. Google has been making it clear they want to move forward with Hangouts, which we have no plans to support. For now, you’ll still be able to sign in to Google Talk and talk to people using Hangouts, but we have no information about how long this will be possible. Speaking of deprecated services, we believe MSN is now totally dead. We expect this to be permanent, we currently have no plans to support Skype. Facebook Chat will also stop working on April 30. We have no plans to continue support.